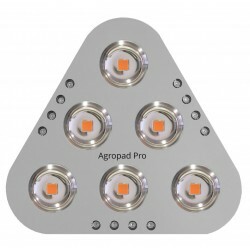 Refurbished items are a great way to own a high-end Agrotek LED grow light at a great price. While they might have slight imperfections (such as paint drips, small bumps or marks) they are fully functional and will give you the same result as our brand-new lamps. All our refurbished lights have been thoroughly tested and come with the standard 1-year warranty. Note that stock is limited. This page is updated daily so be sure to come back often! Refurbished LEDs There are 5 products. The perfect light pack for your indoor garden, up to 85cm*85cm. With this pack, take advantage of a total LED power of 430W. It contains: Two 220 W Le Spot full-spectrum LED grow lights Two power cords Two variable-length hanging kits for a smooth set-up Free shipping! The perfect light pack for your indoor garden, up to 120cm*120cm. With this pack, take advantage of a total LED power of 880W. It contains: 4 220 W Le Spot full-spectrum LED grow lights 4 power cords 4 variable-length hanging kits for a smooth set-up Free shipping!